It can happen that you are focused on some issue, and a rune is hard to interpret or can have several interpretations. Whenever I am unclear on a rune, and often when runes are upside down and I want to make sure I am getting the full picture, I will do a guidance spread on that particular field. To do this, I open up the RMA in another tab/window and do a 5-card guidance spread on the field of the enigmatic rune. 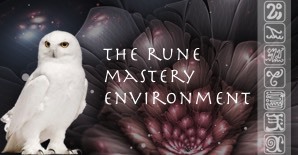 Before I select the runes, I feel the rune in question in relation to my issue or area of focus, connect to the angel gods of that field, attune to the field and its themes, qualities, and Song, and then select the runes. I then ask for further clarity and support. After exploring the additional guidance provided by this spread, go back to the original one and see how it may have expanded your interpretation and brought clarity. Other uses for the 5-rune guidance spread are given in the next Q&A.